“The Railway Man”: Forgiveness is more powerful than hate | J.W. Wartick -"Always Have a Reason"
“Railway Man” is a film based on a true story about WW2 prisoners of war held and tortured by the Japanese. There are SPOILERS in what follows. Colin Firth plays Eric Lomaz, one of the prisoners. He struggles with PTSD and his wife tries to help him through it. Ultimately, he finds that Takashi Nagase, one of the Japanese soldiers who tortured him, is still alive. He goes back to confront Nagase with malignant intent, but cannot bring himself to kill him. Instead, he goes back to the United Kingdom after the confrontation. Nagase writes to Lomaz in apology and of how he is working towards reconciliation. In the final scene, Lomaz returns with his wife to speak to Nagase, thank him for his work on reconciliation, and offer forgiveness. The way this film plays out therefore offers a powerful apologetic for the Christian worldview, which values forgiveness very highly. Nagase turned to Buddhism to try to make penance for his sins and work towards reconciliation, but only in the act of forgiveness is any comfort found. True reconciliation is found in the act of forgiveness and the realization that only by acknowledging the incapacity of humanity to work off their sins might one come to the free gift of grace. Nagase is redeemed, but he is redeemed through the free, unmerited forgiveness offered by Lomaz. Here we have a powerful message which, though never explicit, speaks of the Christian worldview and power of forgiveness. I was greatly moved by this film. Christians can reflect much on the power of forgiveness and the need for reconciliation from the film. 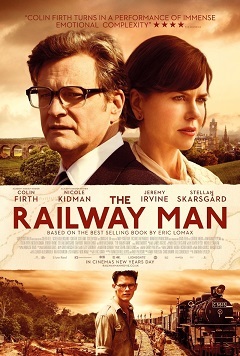 There are a number of themes running throughout “The Railway Man” which have not been discussed here, so feel free to bring more up in the comments. It is a film with great power, and I recommend you watch it. « Exegetical Fallacies- Who determines when it’s a fallacy? Looks like a good movie, Thanks for your review J.W. !